Ultra Runner, what does it take to become one? Almost anyone can run a marathon. Maybe not win a marathon. Maybe not run the Boston marathon. But the average person, with enough training and discipline can run the marathon distance of 26.2 miles. However not everyone can run an ultra marathon. So what does it take to run an ultra marathon distance? Well I'm working on finding that out for myself. So far, from what I gather, in order to run ultras, one must be extraordinarily determined, disciplined and incredibly passionate about running long distances. I dare say, one must truly be in love with and have a very compatible relationship with running. Some might even say, one must be a little crazy, or at least have somewhat of an obsessive personality. A marathon is 26.2 miles, so an ultra marathon is anything above that. The usual ultra marathon distances are 30 miles, 50k, 50 miles, 100k and 100 miles. According to my friend Tara who completed her first 50 mile ultra last year and has run three 100 mile ultras this year the most important component of ultra runner training is the back to back long run. Which she talks a little about in our interview here. 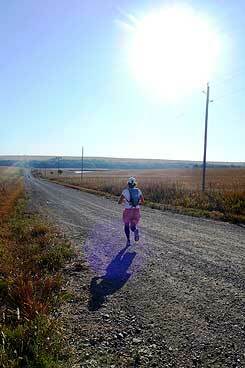 Here you can check out my blog as I train for my first ultra marathon of 30 miles. With one 50 mile and three 100 mile ultra's under her belt, Tara has no plans to stop. While some of us spend months and even years training to run a marathon, Tara, runs marathons back to back as training runs. Her blog is packed full of running advice as well as very impressive accounts of her training. Here is my interview with her. Marny trains in the Rockies of Colorado. And completed two 50 mile ultras this year. Check out her blog here.